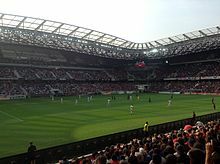 Staidiam spóirt i Nice, an Fhrainc is ea Allianz Riviera . Toilleann an staidiam 35,624 duine. Tugadh an leathanach seo cothrom le dáta an 4 Samhain 2017 ag 13:38.